Chinese Maple, Catskill, NY, 1981; oil on canvas, 14 x 28 in. Someone recently asked me why I'd stopped doing complex landscape paintings; I answered that I wanted to get closer to 20th century reductive abstraction, which I love. But that's only part of the story: I also wanted to get out from under the heavy burden of content, the meaning––environmental, sociological––of those paintings. 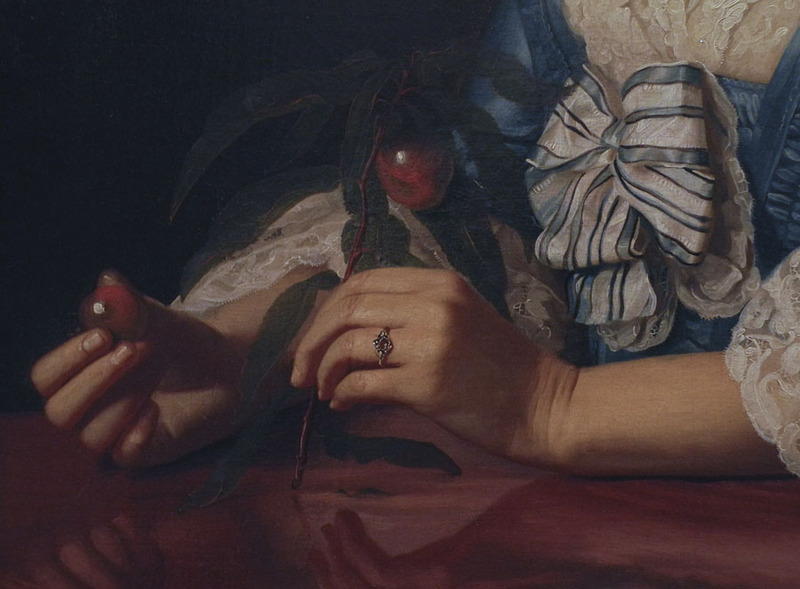 So this post is meant to tell the story of my journey, and it is related to my recent posts on William Carlos Williams, "no idea but in things", and John Singleton Copley, "The Primacy of the Object". When I was a young artist exhibiting my "portraits" of domestic architecture, it never occurred to me to wonder what my paintings were about, except for the formal aspects of light, color, composition, form, mass and detail. I had studied with Philip Pearlstein, who eschewed "meaning" in his painting. The figures in his work were not metaphors or narratives; they were bodily facts, used to create dramatic compositions. As a full disclosure, I have to mention that for a few years around this time I also painted narrative figure compositions, so whatever yen for story I had went into those. The Potato Field, Cutchogue, NY, 1982; oil on canvas, 15 x 34 in. 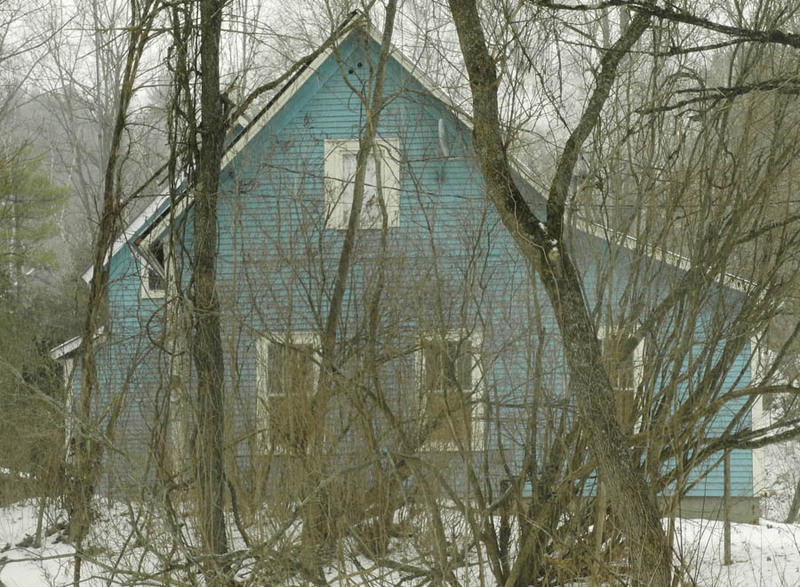 Soon I began to expand my field of vision to include the landscape around the houses. Because I was still very interested in structured compositions, my attraction was to land that had been worked: an agricultural landscape. I slowly began thinking about the meaning that resided in the land. Tractor and Ag-Bags, Groton, Vermont, 1994; oil on canvas, 30 x 90 in. I read books in cultural geography, such as John B. Jackson's Discovering the Vernacular Landscape, and John Stilgoe's Common Landscape of America: 1580 to 1845; and books that explored the meaning of art beyond the formal, such as T. J. Clark's The Painting of Modern Life: Paris in the Art of Manet and his Followers, and W. J. T. Mitchell's Landscape and Power. Now the landscape was no longer simply a beautiful expanse of space and light, but carried history and culture; it showed all aspects of its use and abuse. The agricultural landscape became, for me, evidence of the positive and negative aspects of our relationship to the land. 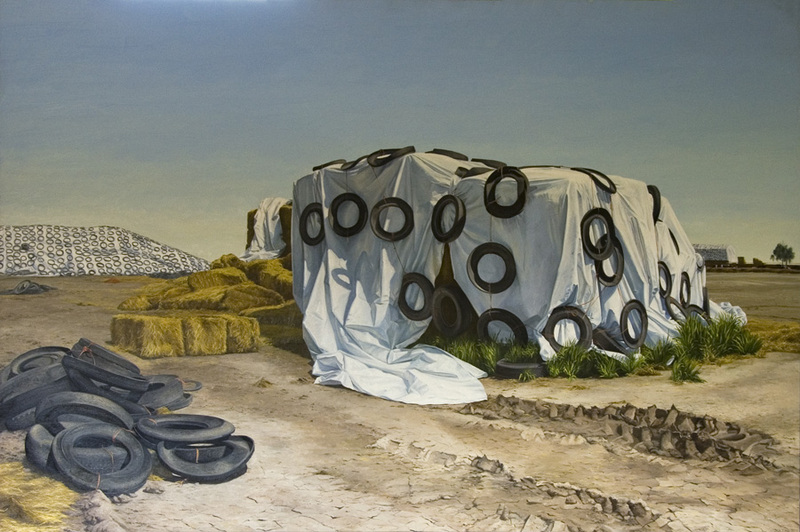 Hay Storage, Central Valley, California, 1995; oil on canvas, 44 x 66 in. In the early 90s, for three years, I taught in California. Being there was a huge shock to my understanding of agriculture: this was the land of industrial farming, the image above at a dairy where they milked thousands of cows. Single vegetable crops were grown in huge acreages, everything prodded into growth with fertilizers, pesticides, and irrigation. As a colleague of mine mentioned, "the soil is just there to hold the plants up". So all these meanings resided in the paintings I was doing; they weren't overt, but they directed my subject matter of plastic and tires, machinery and manure. 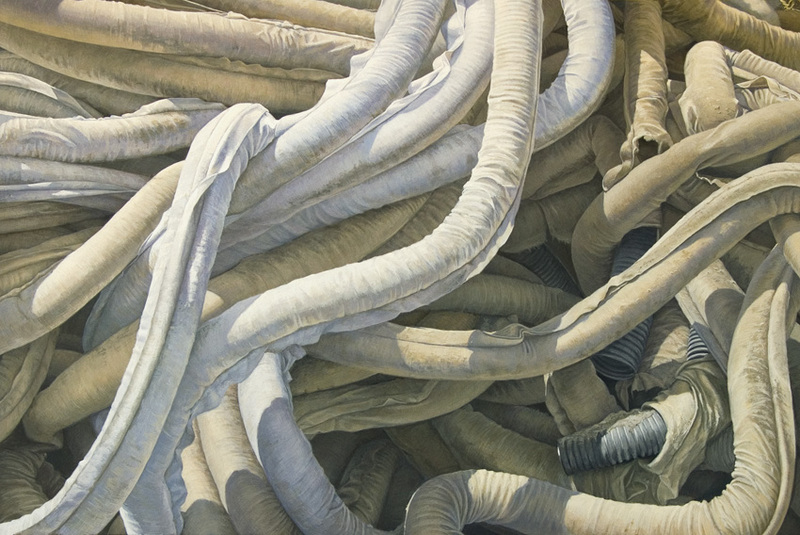 White Hose, 2005; egg tempera on panel, 28 x 42 in. In 2002 my focus shifted again, influenced by still life photographs I was doing with my first digital camera. The landscape left the picture and all that remained was the stuff of agriculture, the machinery, the plastics, the silage, the concrete. At first the paintings were large and complex, but as time went on, I made the compositions simpler as I zoomed in to the subjects. I began to feel hemmed in by my content; what had motivated me before––the difficult environmental and social issues around farming––became extraneous to my concerns, which were formalist. 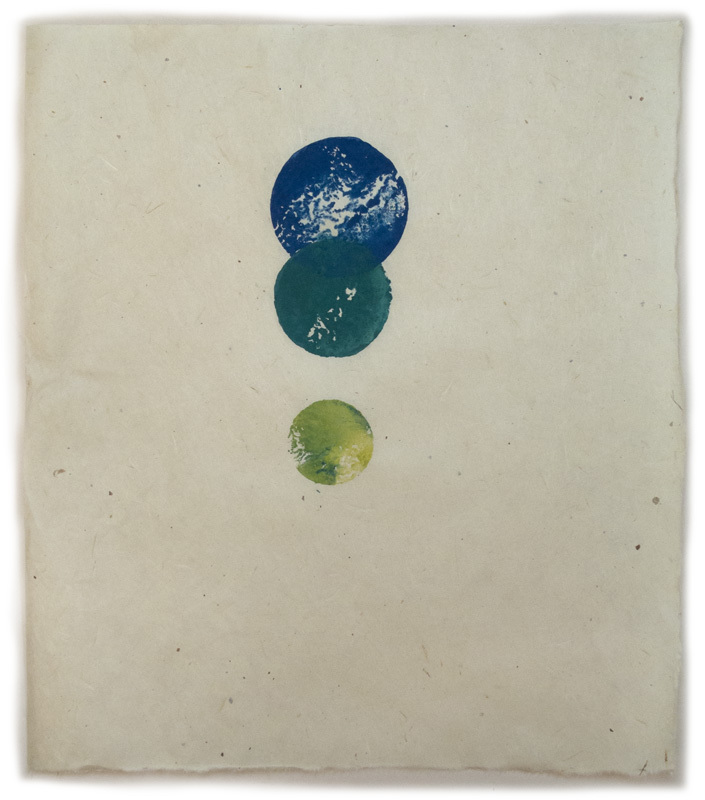 Opening, 2013; egg tempera on calfskin parchment, 5 1/2 x 7 1/2 in. 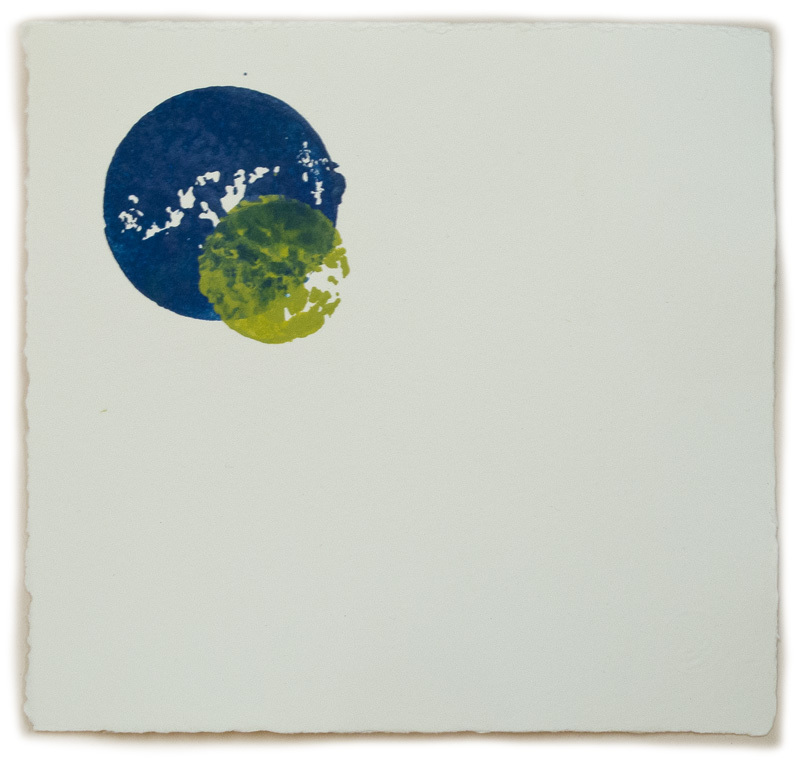 In 2010 I began to paint very small works on parchment; their compositions have become quite simple and direct...."no ideas but in things"....and the things are in themselves enough. I still find my subjects in agricultural implements; they have such variety of shape and color that they are of continual interest to me. But I don't expect any story beneath them, any social/historical/environmental content; there is enough meaning and feeling and mystery in color/shape/form/light/composition. I know there are many people who wish I was still painting large complex landscapes, but I have to answer, in the immortal words of Bartleby the Scrivener, "I would prefer not to". My two most recent cardboard prints had images that broke the rectangle (see here and here), so I thought it'd be fun to stay inside the box this time. I had the idea to use triangles that would touch the edges of a square and did lots of thumbnail sketches and color studies until I came up with this composition. Each triangle touches the edge with two of its points, and they have a feeling of spinning around a center. I chose to print with a dark reddish color on a dark paper; looking at the print now, I think that if I'd used a light, bright color the mood would be very different, less weighty and more buoyant; but there's an edginess to the dark that I like. Untitled 48, ink on Gampi smooth paper, 12 1/2 x 11 in. After finishing the cardboard prints I made some potato prints, as I usually do. It's a good way to use leftover ink and paper. Often before starting to work on these, I feel less than enthusiastic, wondering if I should continue with the series. I think I don't have anything new or interesting to say with them, but....I give myself a little push and start working and soon get into the swing of it. I guess it's the improvisational aspects of these prints that makes me nervous. Untitled 49, ink on Twinrocker paper, 2 panels each 15 x 6 1/2 in. I have no plan, though I do cut the potatoes in a few shapes that I will use for that session. The day I worked on these prints, I tried out my new set of round biscuit cutters in different sizes. Untitled 50, ink on Twinrocker paper, 7 x 7 1/2 in. 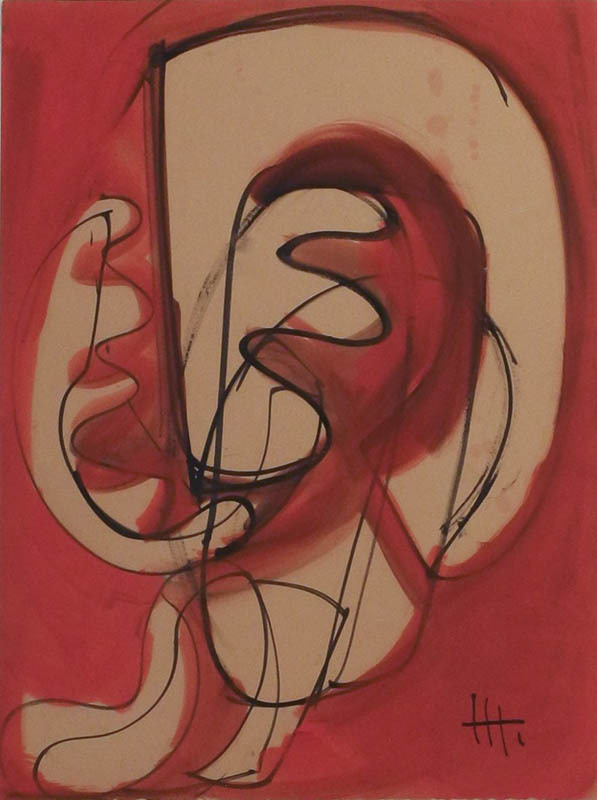 Untitled 51, ink on Twinrocker paper, 7 1/4 x 7 1/2 in. So the theme of the day was circles. Untitled 52, ink on Gampi smooth paper, 10 1/2 x 10 1/2 in. Maybe I was thinking about spring? 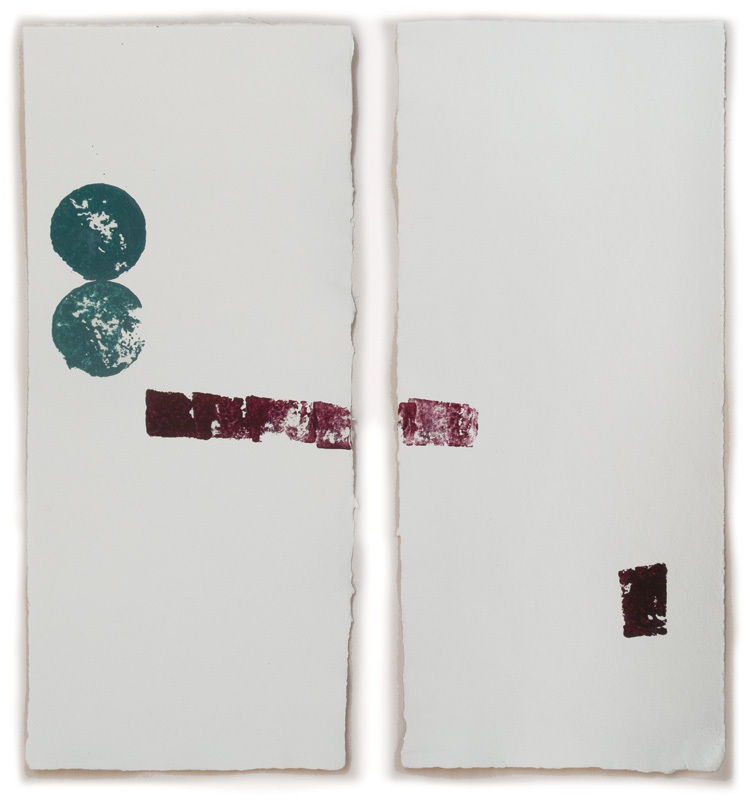 Untitled 53, ink on Gampi smooth paper, 2 panels each 12 1/5 x 10 3/4 in. For this final piece I worked with small rectangles. I did one panel at first, but wasn't satisfied with it so tried again with a similar composition. 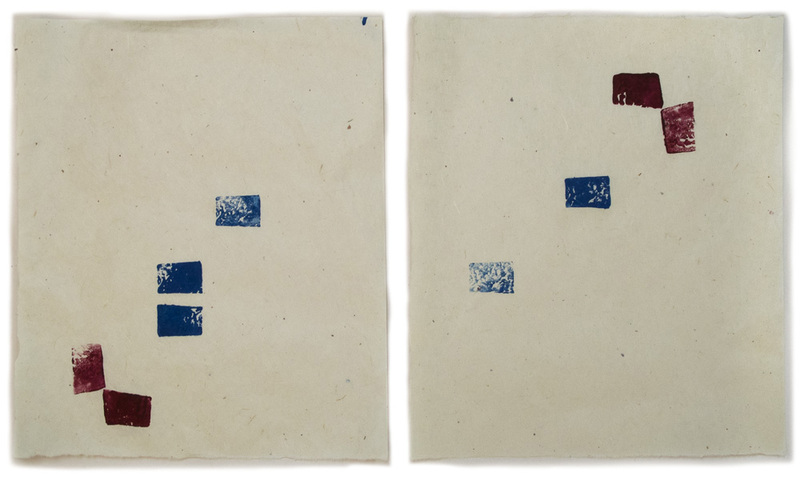 Then I thought that maybe the variation on a theme works as a diptych, musical notes across the pages. 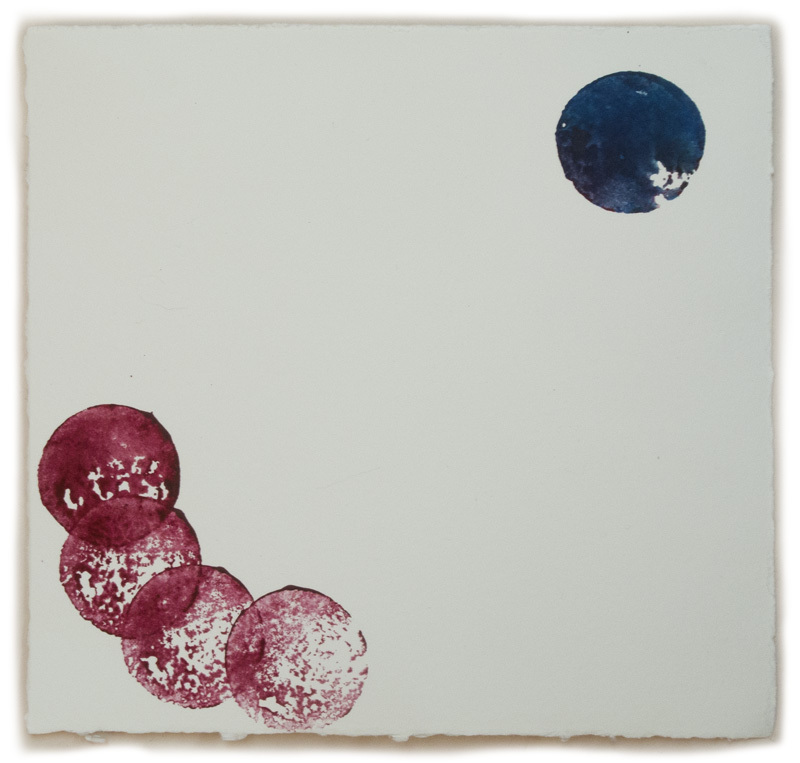 There are aspects of form, and their relation to empty space, that I explore only while making potato prints, so perhaps that it enough to keep doing them. But the thing that always stands permanently in the way of really good writing is always one: the virtual impossibility of lifting to the imagination those things which lie under the direct scrutiny of the senses, close to the nose. It is this difficulty which sets a value upon all works of art, and makes them a necessity. Ginsberg adds: "So 'no ideas but in things', or 'close to the nose'". When a student asks if the poem is so visual, why not take a photograph, Ginsberg responds that the writer is "practicing a speech consciousness, not an eyeball consciousness". As a visual artist, I try to practice that eyeball consciousness, related strongly to Williams' "no ideas but in things". A poem that sticks with me, its glittering image beautiful and hopeful amid detritus, is "Between Walls"
I always figured that "so much depends" means he whole mind depends on the image. Or, "so much", a clear apprehension of the entire universe: just being there completely mindful––"I heard a fly buzz––when I died"––that's Emily Dickinson's line. The local is the universal. Look! that's where painting begins. A bird, up above, flying, may be the essence of it––but a dead canary, with glazed eye, has no less an eye, for the well seen becomes sight and song itself. It is in things that for the artist the power lies, not beyond them. Only where the eye hits does sight occur. So––that's what he was trying to do, get that particular flower of perception blooming in America....trying to compose poems that are indistinguishable from the actual perceptions of our ordinary mind; but which when recognized, and appreciated consciously, transform the entire feeling of existence to a totally new sympathetic universe where we're at home, where we're playful, where we're generous, because the mind overflows with its perceptions, and the perceptions are all generous because they're not blocked with anger. This is Ginsberg seeing Williams through a Buddhist sensibility, but one attainable, and important, to us all. I have a number of recipes that for me are perfect for winter; I make them once or twice each season so they never lose their special quality. One is Madison's Vegetarian Black Bean Chili, another her Lentil Croquettes; there are Stuffed Peppers from Claudia Roden, and a Smothered Cabbage with Pasta, the origin of the recipe lost in the mists of time; and a year-long favorite that I make most often in winter, a family recipe, Rice and Lentils with Caramelized Onion. I love having soup for lunch, but these other recipes are dinner. The meal pictured above, spicy stir-fried tofu with coconut rice from Deborah Madison's Vegetarian Cooking for Everyone, is one I enjoy making with its interesting combination of flavors, spicy and sweet. I usually eat it with last summer's peas from the freezer, which seem a perfect accompaniment. Although the list of ingredients seem long, it's quite simple to prepare. Add rice and 1/2 teas salt. Stir to coat grains, then add coconut milk, 2 cups water, and lime leaves or zest. Bring to a boil, lower heat and simmer until rice is done, 15-18 minutes, stirring a couple of times. Turn off heat and let sit while you prepare tofu. It will be wet at first but will absorb moisture as it sits. Drain the tofu, then cut into 1/2 inch cubes. Combine spices, 1 teas salt and sugar in a bowl, add tofu and stir gently with a rubber spatula. Add scallions and cook until wilted, then add lime juice. 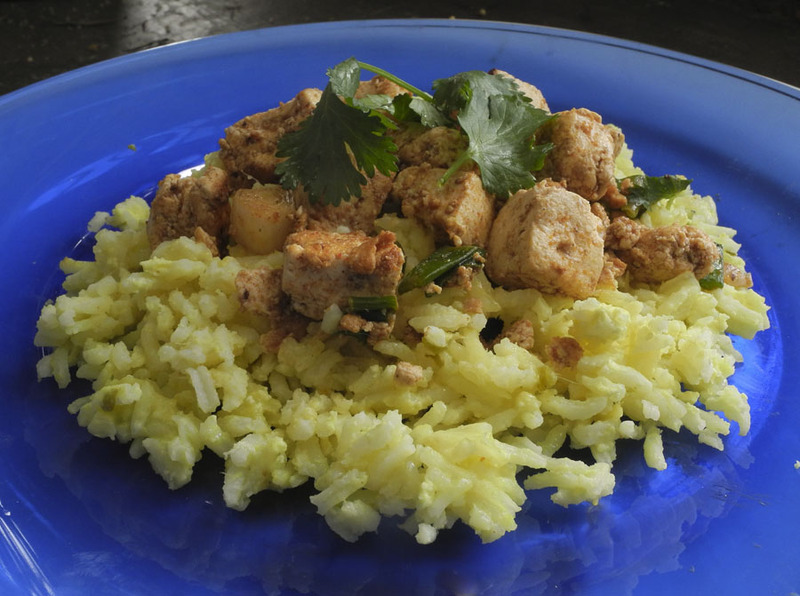 Serve tofu over the rice, garnished with cilantro. 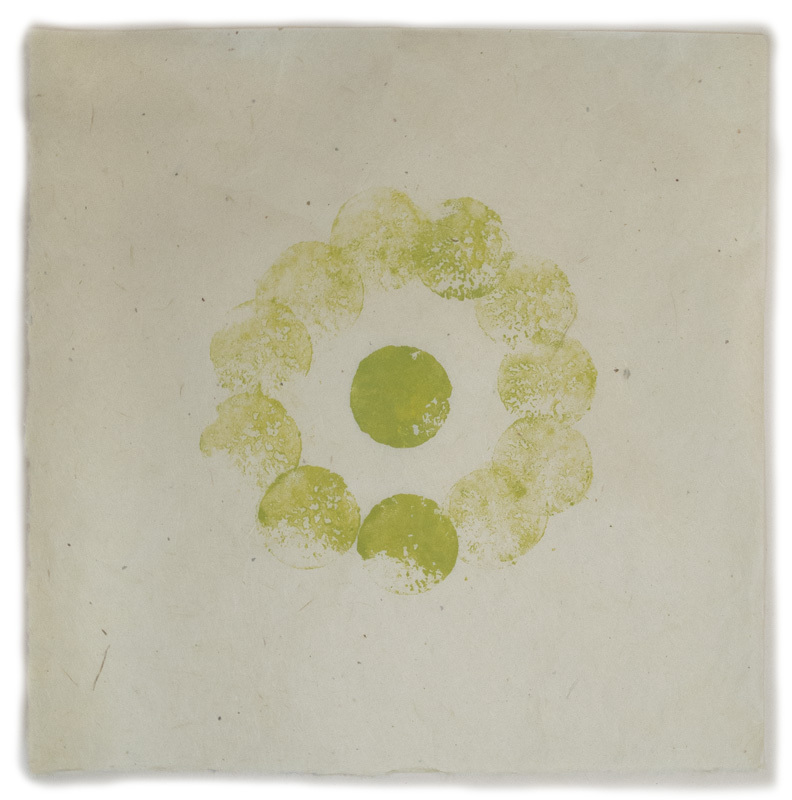 Green Curve, egg tempera on calfskin parchment, 7 1/2 x 7 1/2 in. When I look for subjects for my paintings, I usually choose objects in bright light: the contrast of light and shadow with the subtleties of reflected light, and the shapes of cast shadows, add another layer of interest to the painting. Sometimes, though, I come across an image that is intriguing to me without the added drama of sunlight, such as with Green Curve. 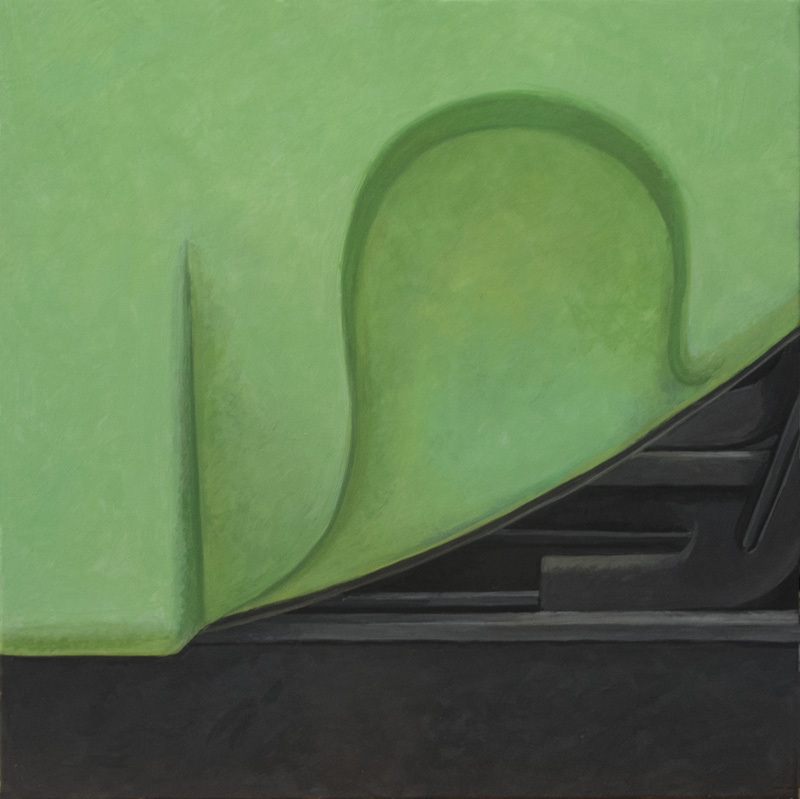 I liked the large curve of green, broken by two interior shapes––a depressed curve and a straight projection––above a more complex array of black shapes, mainly horizontal, with some echoing the curves above. I found this contrast of color and shape appealing, and tried to have the green color carry light just as the black is sunk into darkness. 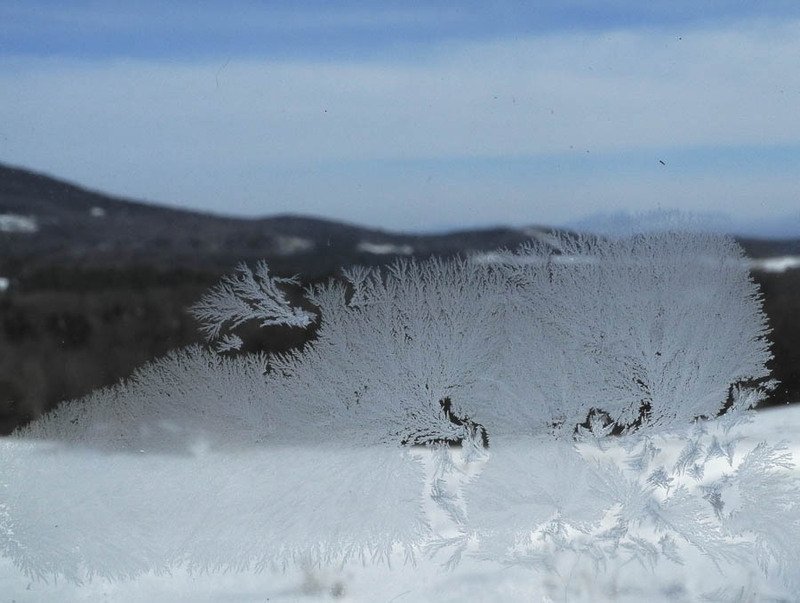 The only things I miss from the old storm windows are the beautiful designs formed by frost, often obscuring the entire pane. 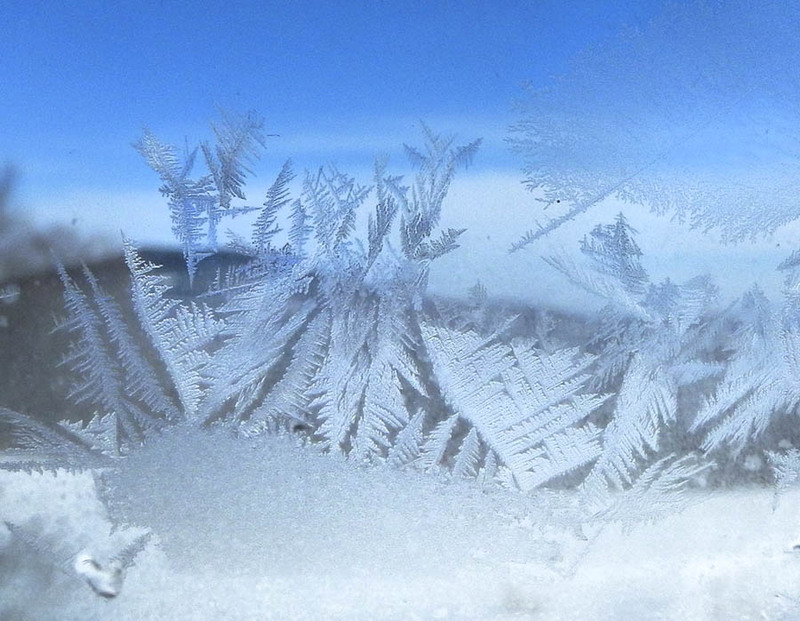 The new double-glazed windows don't lend themselves to being frosted. 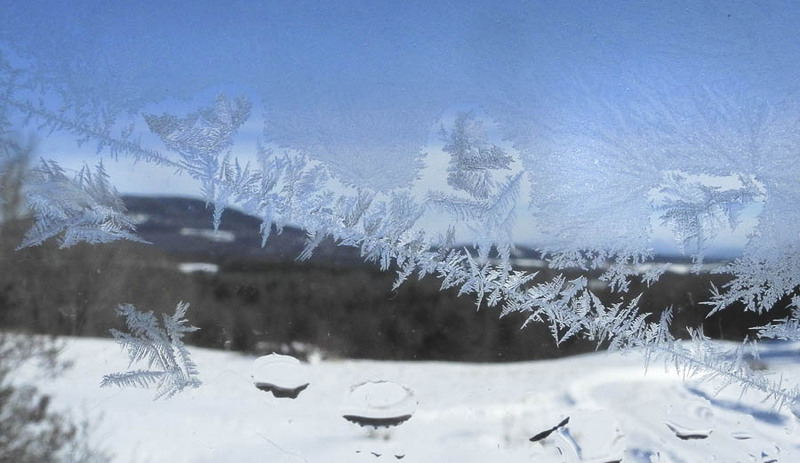 This morning's temperature, however, was so cold at 20 below zero F, only rising to 0 later in the day, that very small patterns formed on the outer windows. Looking closely, the range of expression is marvelous, here feathers sweeping out from a central form, like a large headdress. 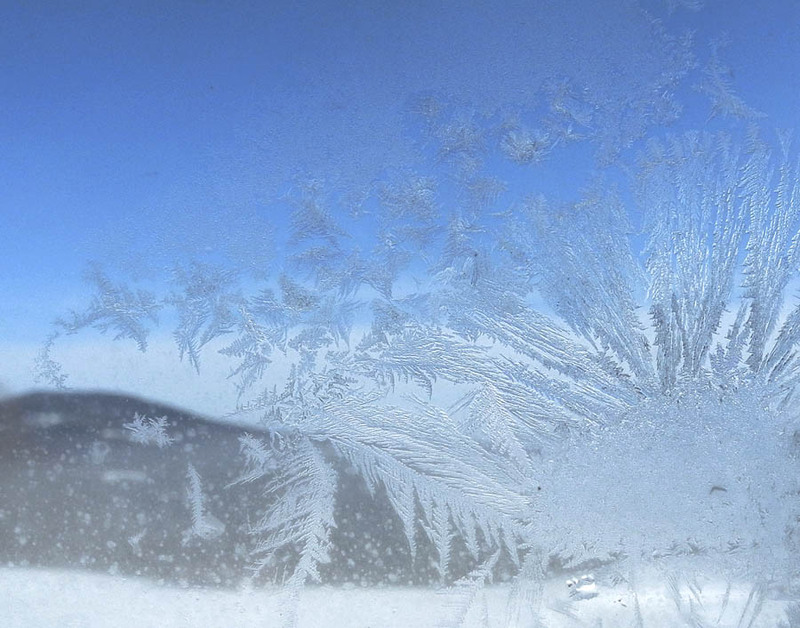 A streak like a contrail crossed the window, with shapes floating above and below as though released from it. More graceful patterns, here reminding me of ferns. This soft gathering of lines takes us underwater, to multi-branched corals swaying with the currents. 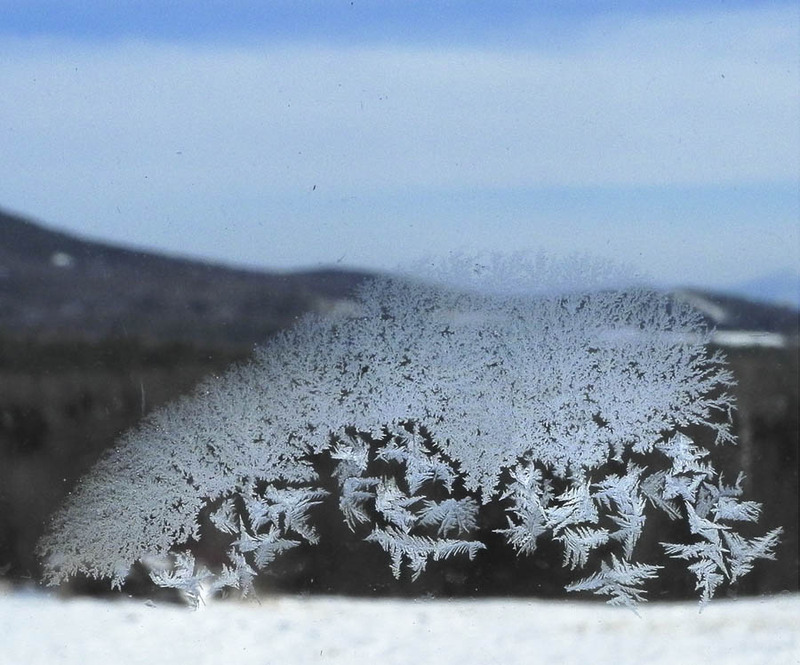 This design has an amusing aspect to me: the profile of a little hill topped by trees? figures? and "clouds" resting above it. 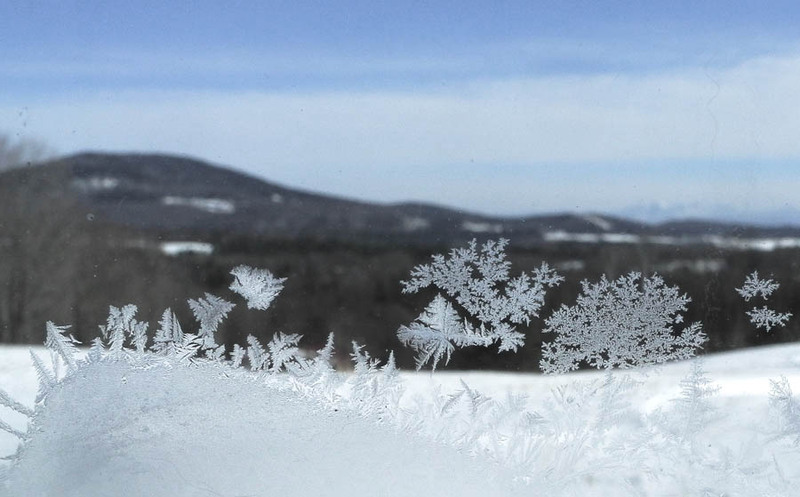 I love the fantasies these delicate bits of frost call up. 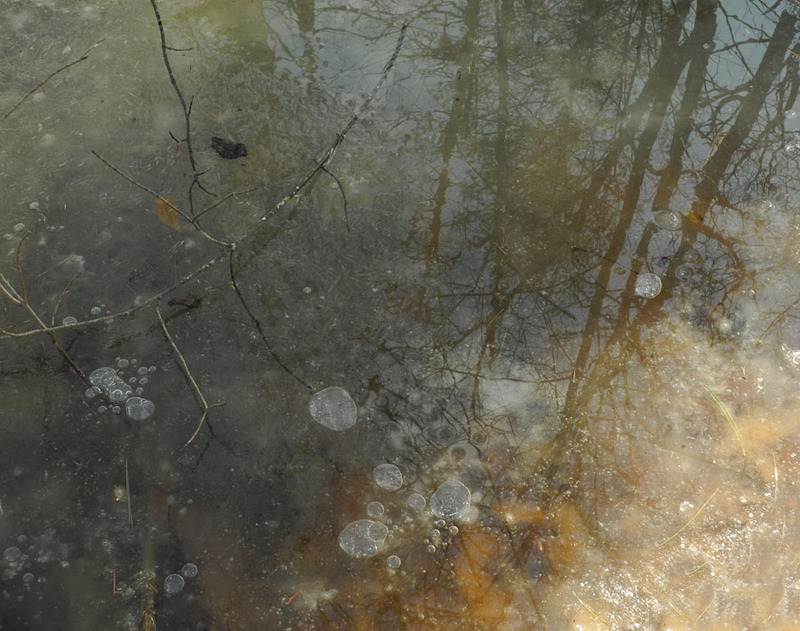 When I look at this last image I imagine a creature moving along, head to the ground, many legs busy. But no, it is fixed in place for only a brief time, magically appearing and disappearing, one of nature's tiny wonders. 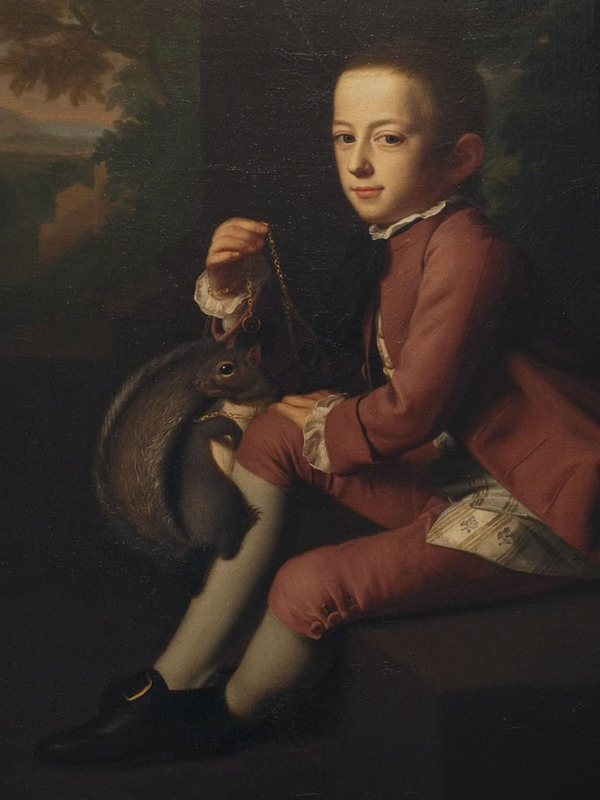 J. S. Copley, Daniel Crommelin Verplanck, 1771; oil on canvas, 49 1/1 x 40 in. 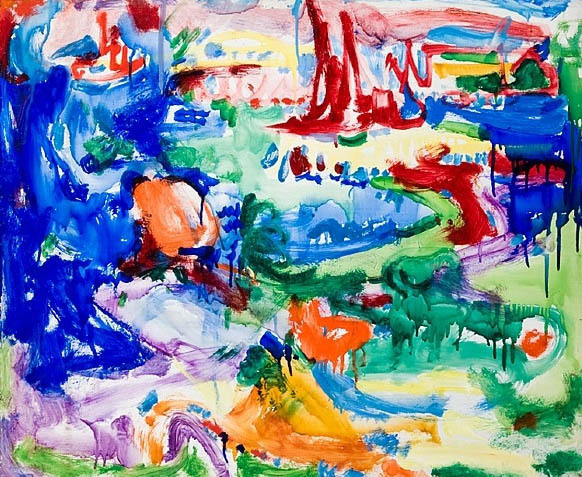 When I think of my painting antecedents I go back to Italian Quattrocento and early Netherlandish painting, Medieval manuscripts, then jump to 20th century abstraction in its reductive aspects; but what I feel is closest to my painting heart is the American painting which traces its lineage from the limner tradition. This tradition emphasized line, flatness, and a primitive sense of form in that it was tactile rather than visual; the fixed reality of edges did not allow for the shifting nature of perception. 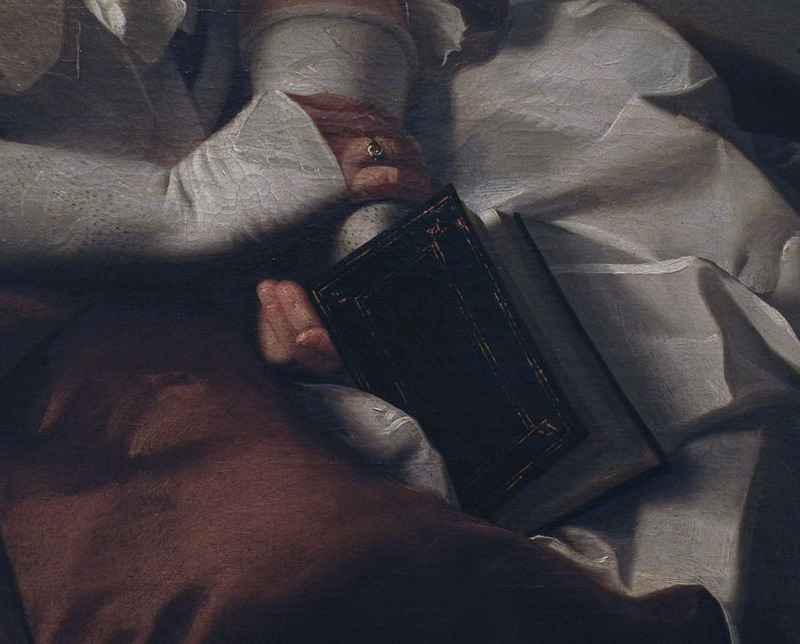 John Singleton Copley exemplified a more sophisticated exponent of this way of seeing, in that his forms are volumetric, elucidated by a soft light, sinking into darkness. 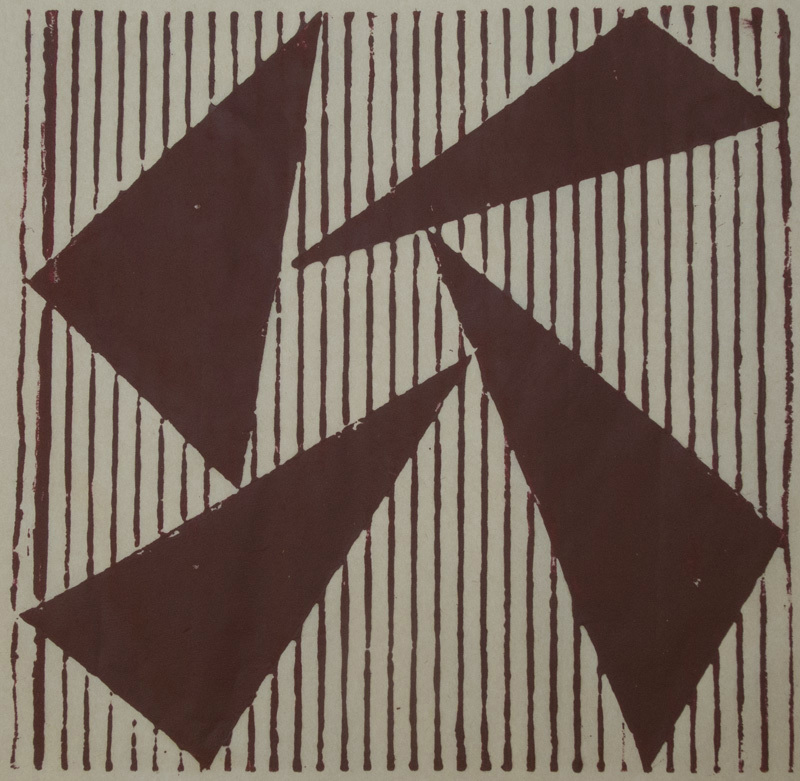 There is still in his work, however, that insistence on the thingness of things, presented in an abstract way, what Barbara Novak, in her book American Painting of the Nineteenth Century, tellingly called "conceptual realism––idea is amplified to become form". And, there is the erasure of the artist's hand. 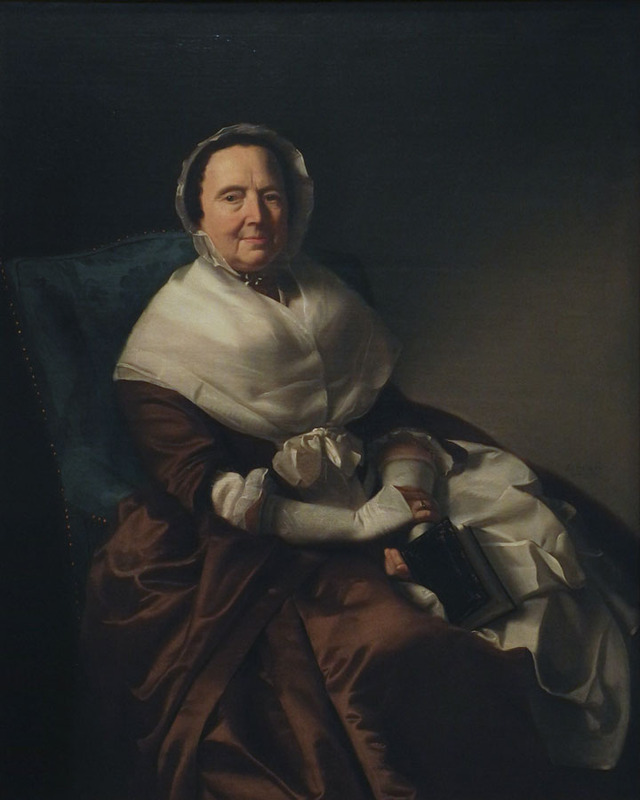 J. S. Copley, Mrs. Sylvanus Bourne, 1766; oil on canvas, 50 1/4 x 40 in. Copley's American portraits of well-to-do New Englanders have an almost uncanny presence, solid and still. The artist himself is not present, he is a vehicle for delineating the flesh and beautiful "stuffs" of the upper classes, with exactitude but not with flourishes. I have been thinking of Copley because I am reading a more recent book of Novak's, Voyages of the Self, in which she pairs artists and writers in order to explore the differing attitudes toward the self in American art. In her first chapter, Novak discusses Copley along with the theologian Jonathan Edwards, who died soon after Copley began working. What she sees in both men is a pragmatism, an intense interest in sensation, and "how the mind formulates ideas from sensations", and an interest in close observation of the natural world. 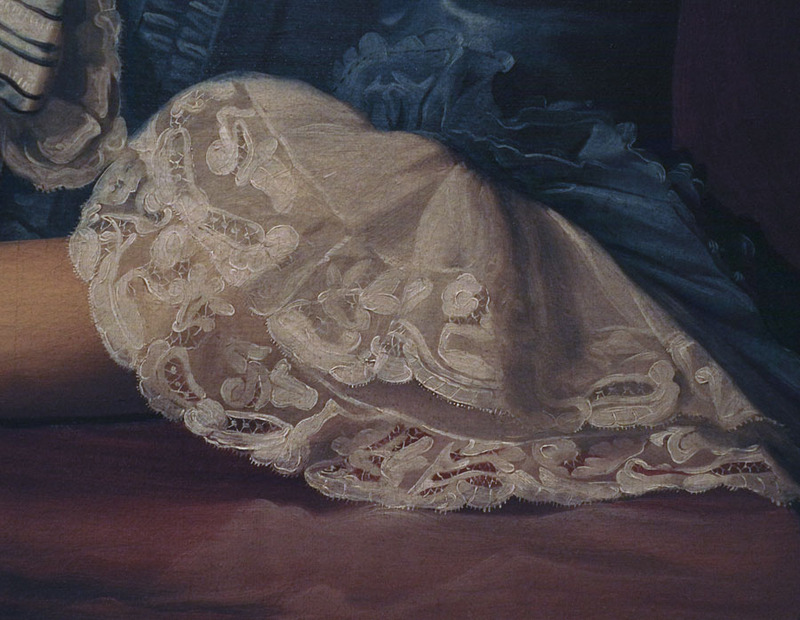 J. S. Copley, Mrs. John Winthrop, 1773, detail. See the entire painting here. "...this is the enigma of Copley. The self as indicated by the artist's hand, the handwriting of stroke, has been erased from the smooth surface. 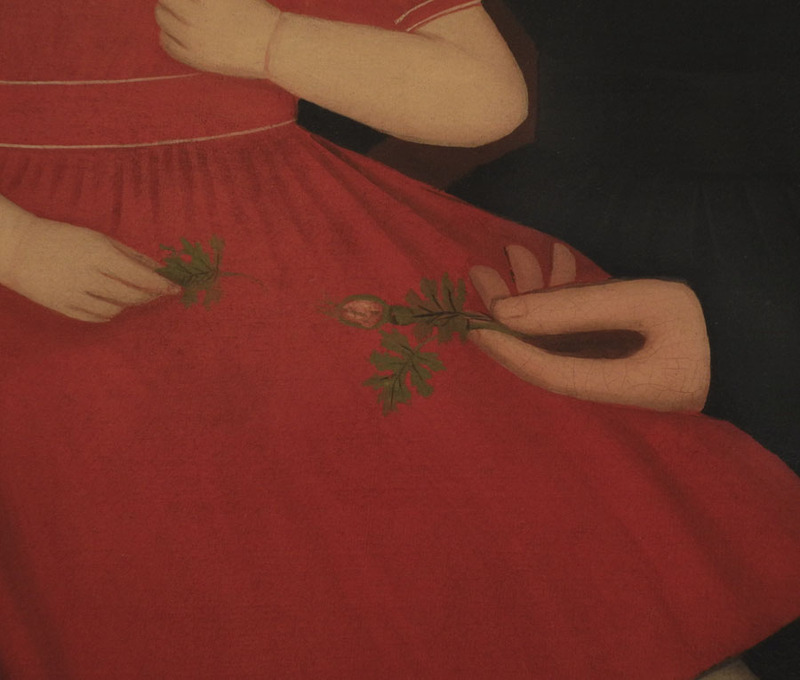 The anonymous paint surface of the primitive has been transformed by Copley into the surface skin of the objects he depicts..."
J. S. Copley, Mrs. Jerathmael Bowers, ca. 1763; oil on canvas, 49 7/8 x 39 3/4 in. See the entire painting here. Novak imagines that Copley's denial of self in his painting might be associated with the Puritan distrust of self. Edwards wrote that he has "given myself, all that I am, and have, to God; so that I am not, in any respect, my own." I find this absence of self in the work very appealing; for me it is a philosophical (not religious) approach that mirrors my own. Ralph Earl was another painter in the limner tradition. He was a self taught painter, but in 1778 went to London, where he studied with Benjamin West, an expatriate American, whose paintings were painterly and emotional. Seven or eight years later he returned to the US where, curiously, he continued to paint portraits in a linear manner similar to Copley's and not like the more fluid works of West. 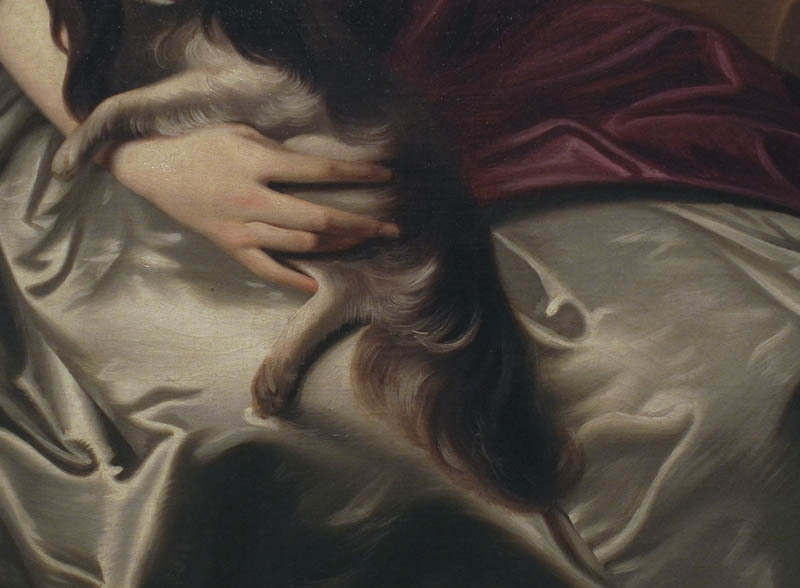 According to the Met's label for this painting, Earl was "appealing to his client's restrained tastes and pious values". 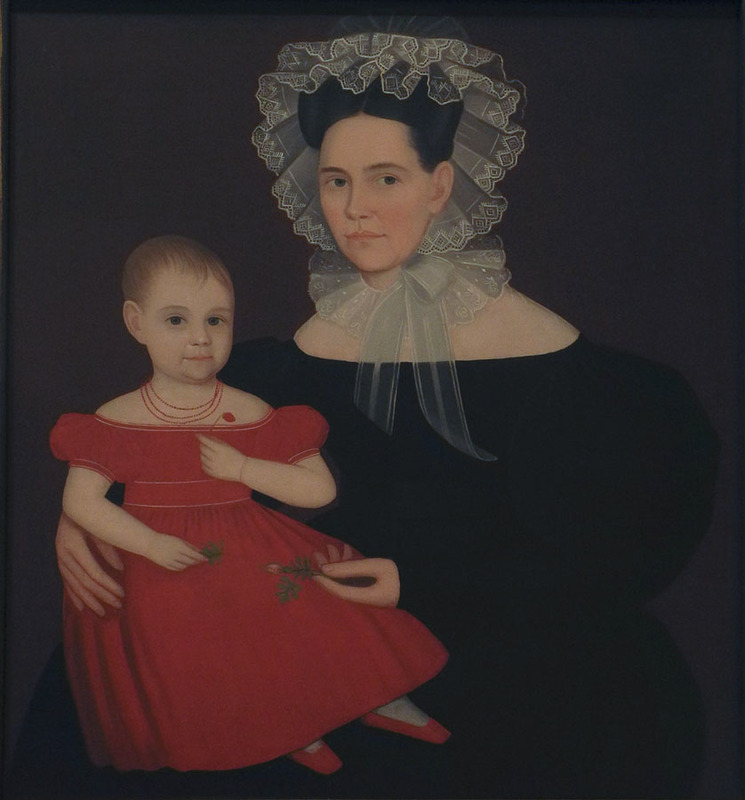 Ammi Phillips, Mrs. Mayer and Daughter, 1835-40; oil on canvas, 37 7/8 x 34 1/4 in. The works of Ammi Phillips, although made later than those of Copley, are in a strong folk tradition, using flat form and simplified details. His sensitive portrayal of his subjects and stunning compositions with strong use of color raise his paintings above the rest of America's itinerant portraitists. Phillips too takes himself out of his portraits; he quietly presents his subjects with grace and attention. Here, a delicate gesture from mother to child is quietly eloquent. 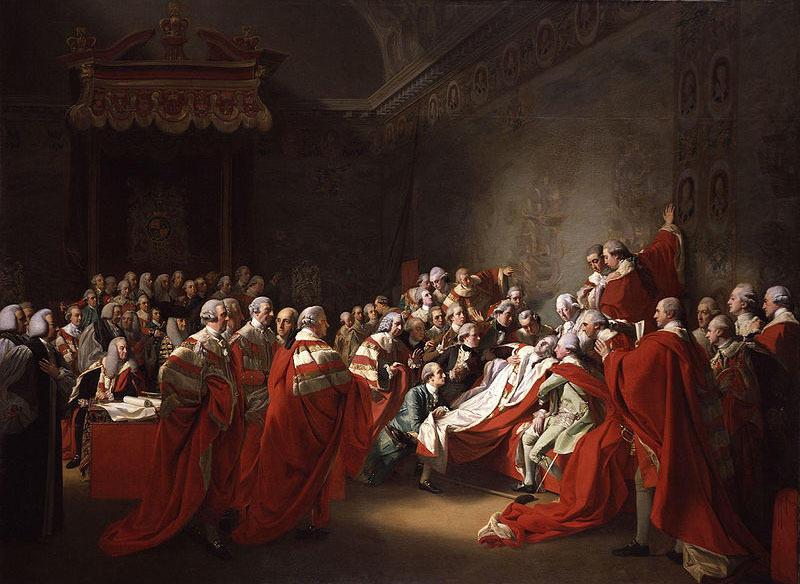 Copley, The Death of the Earl of Chatham, 1779-81; oil on canvas, 90 x 121 in. 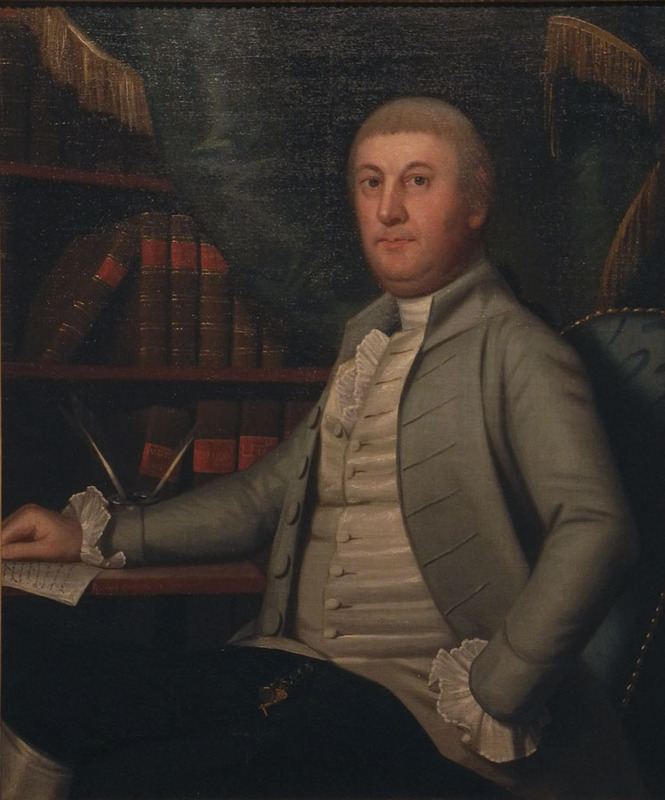 As a Loyalist, Copley was having an uncomfortable time of it in Boston before the Revolution; he was also anxious to visit Europe to see the paintings there. He left for London in 1774, toured the Continent, then settled in London. His paintings changed irrevocably: the artist had appeared, with brush strokes, drama of light and story, history, movement. It was for me a great loss; the early portraits have a near transcendent beauty and depth of feeling that comes from the artist's close attention to the things in front of him, as he loses himself while paying them homage. 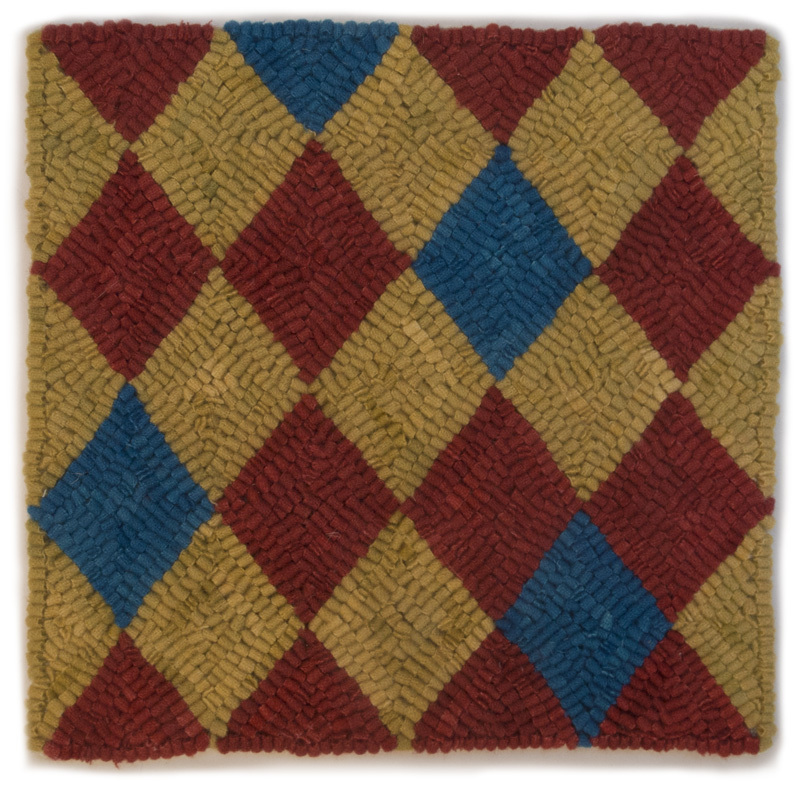 Three Color Diamonds, hand dyed wool on linen, 10 x 10 in. My new textile for the new year is an addition to an occasional series––pattern––using a repetition of shapes to create the composition. You can see a few other works in this series here. With this piece I chose to break the color pattern by substituting blue for three red shapes and one yellow; it's a random choice, based on visual balance. A color effect I hadn't expected came in the lower right corner where the blue, substituting for yellow and surrounded by red, had a very different presence than when surrounded by yellow. 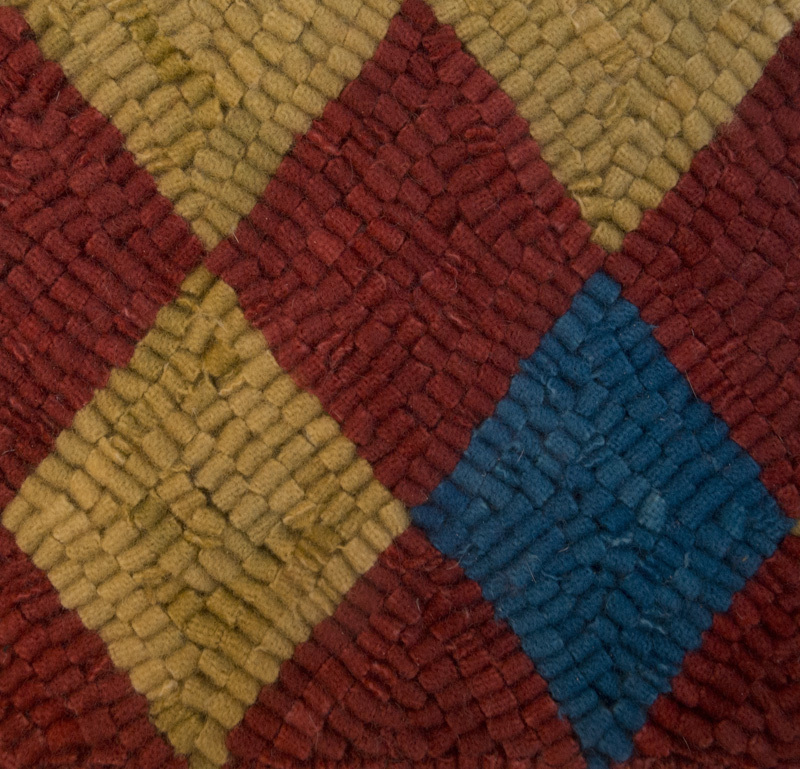 The red and blue form a dark mass which breaks up the rhythm of dark/light across the textile, an irregularity which highlights the basic regularity of the pattern. 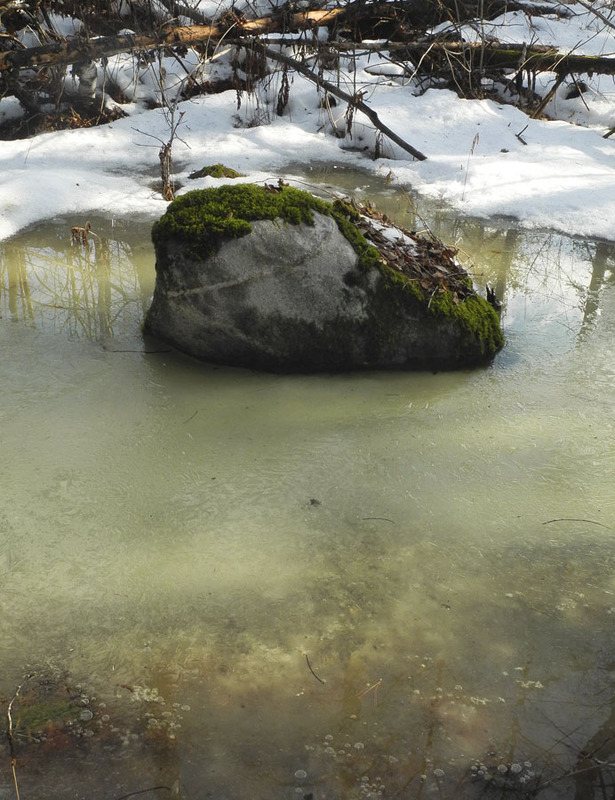 The frosty nights have left ice in the center of the ponds, a greenish crackled surface. 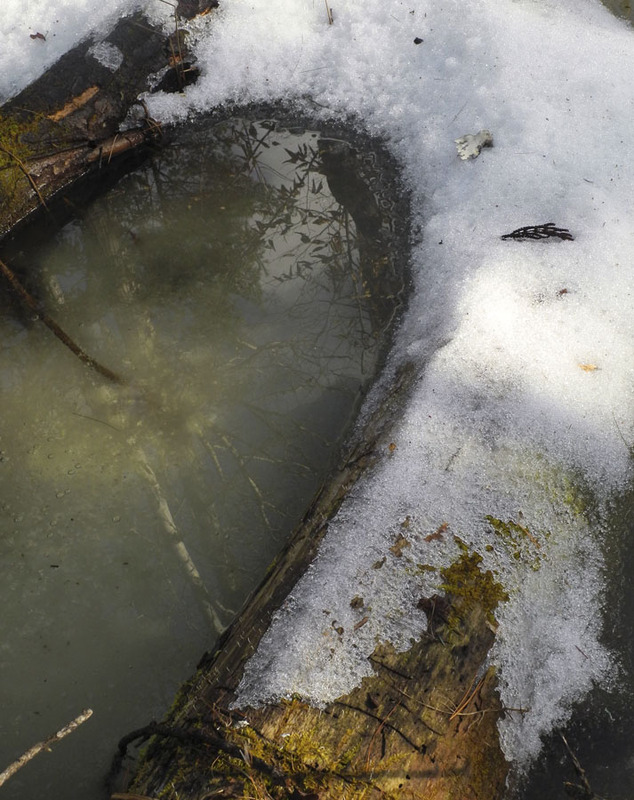 Delicate reflections are nestled in the curve of a fallen tree. 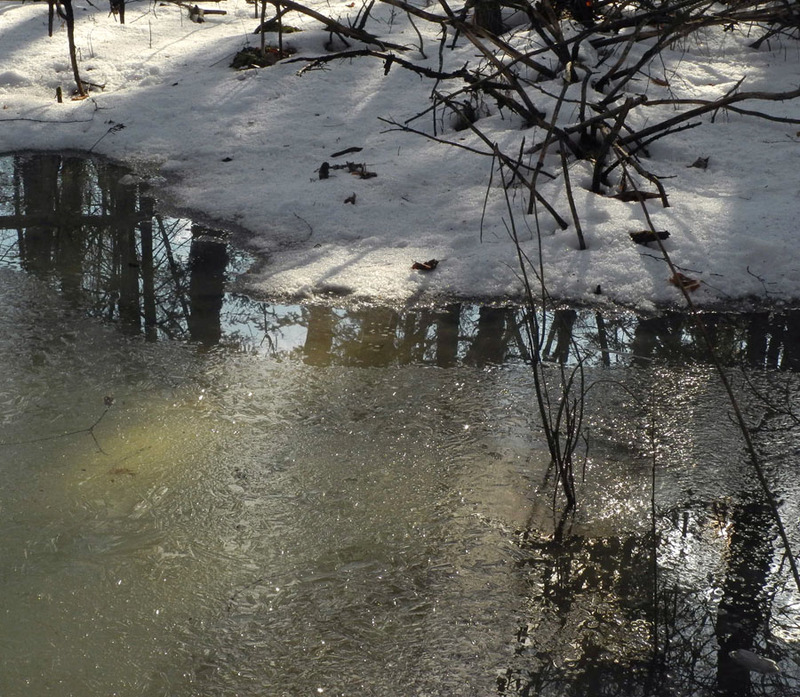 There are magical layers of reality in the pools, as we see objects caught in the ice, submerged beneath it, reflected in the water. 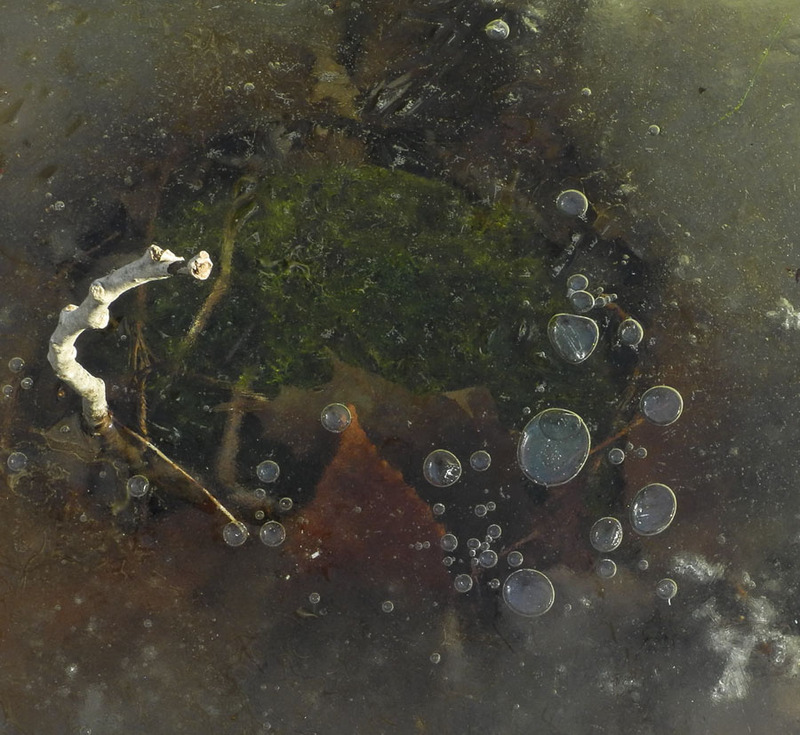 The frozen bubbles are especially marvelous, hovering over a moss covered rock. 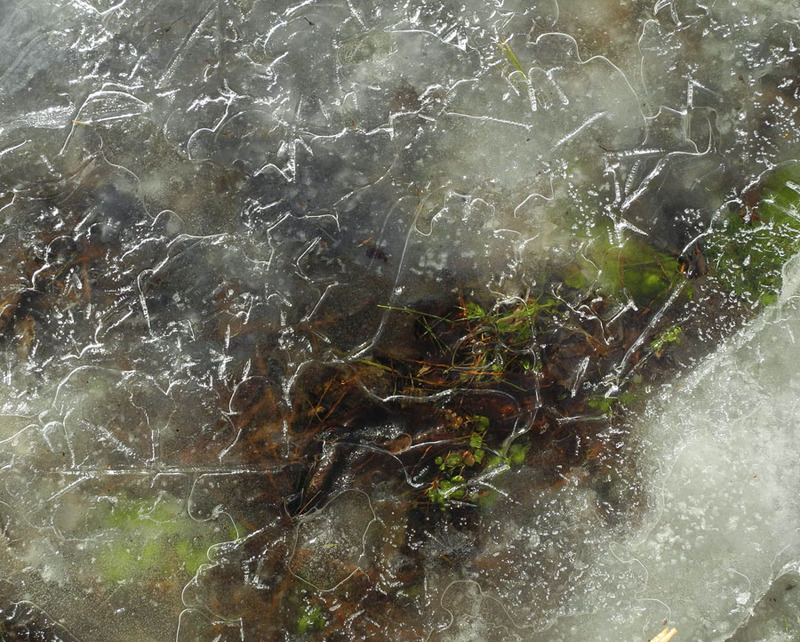 A smaller pool had a spectacular all-over pattern of icing, like a complex jigsaw puzzle. Each edge caught light in a delicate line, barely obscuring the forest floor below. 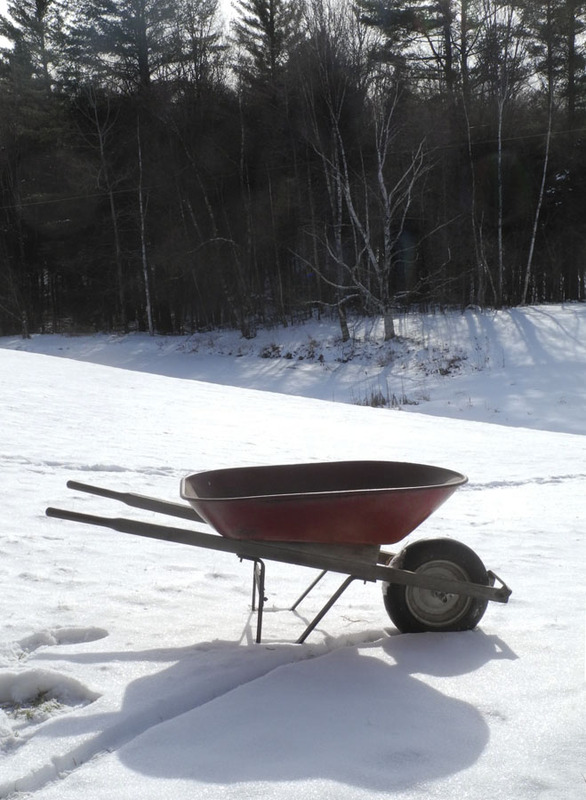 It is lovely to have a brief respite from the cold, to be reminded that spring will indeed arrive, but I always feel sad to see bare ground in winter; it seems too far from the right order of things. 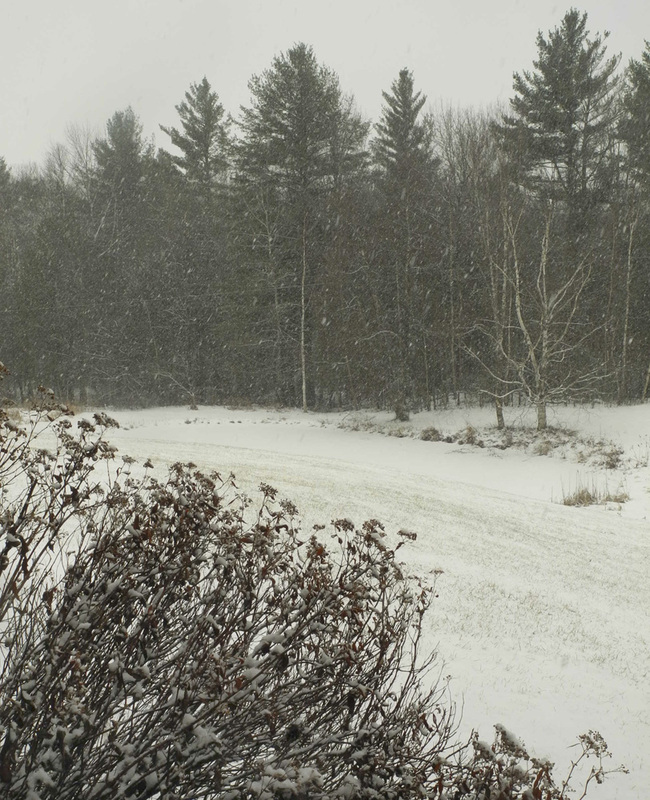 So I was happy today to wake to a very light coat of snow on the ground, a gentle return to winter, with snow flurries almost all day long. My cats are not happy; they kept trying to go out but strangely enough it was no longer warm and grassy outdoors, so they sat on the porch and drearily contemplated the change of weather. Their friend, though, surveyed the scene with satisfaction. 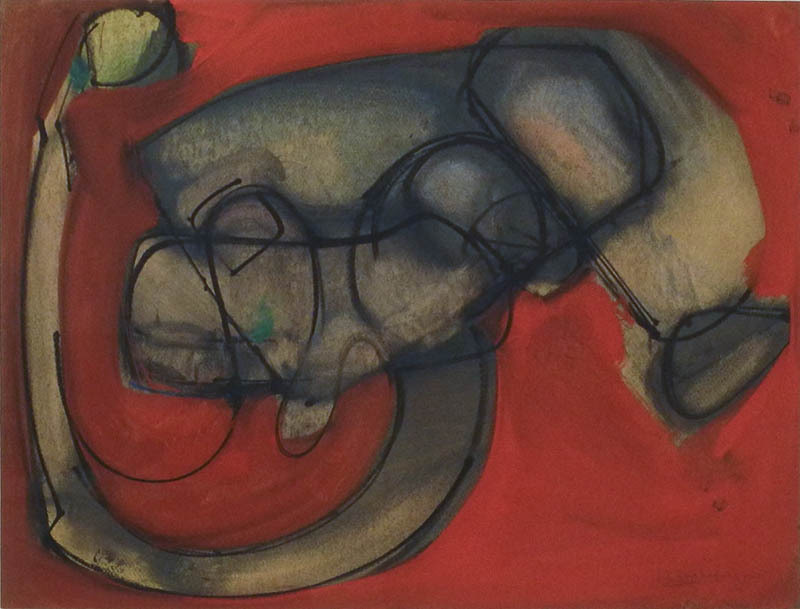 Joy II, 1947; oil on panel, 30 x 35 in. I was perplexed when I walked into Ameringer ❘ McEnery ❘ Yohe gallery recently; the artist's name was not readily evident and when I looked closely at the signature it seemed to be Hofmann. The only paintings of Hans Hofmann that I knew were the painterly geometries of the 60s; the free flowing lines and curvilinear form of these paintings had a very different sensibility, using biomorphic form and transparent color. While the later paintings (see the last image) are pinned in a backward and forward movement, these paintings danced exuberantly. 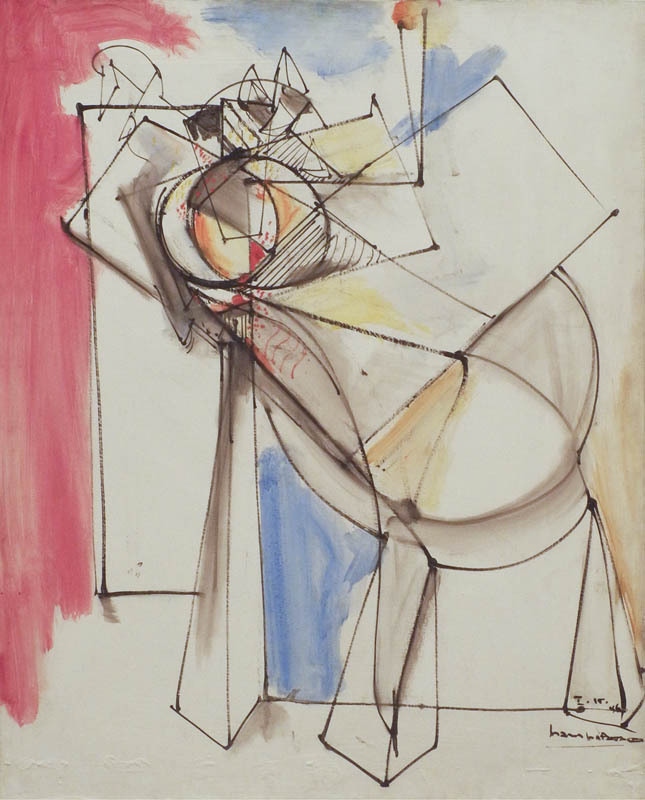 I realized that I had to see more of Hofmann's work and reassess my middling opinion of it. 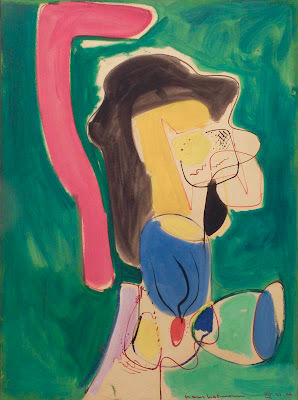 Telescope, 1946; oil on panel, 30 x 24 in. Hofmann (1880-1966) was a German artist, educated in Europe; he studied art in Paris. He is often described as an "American" abstract expressionist although he did not move to the US until 1932, when he was over 50. He then became a famous teacher, with many of his students going on to illustrious careers. You can see an excerpt from a PBS documentary about his teaching here. I liked the man I heard about in this bit of documentary: open, engaged, supportive, excited by painting and what it could achieve. The works from the 1940s in this show at Ameringer ❘ McEnery ❘ Yohe (until Jan 25) have a freshness that is very appealing and were a happy surprise for me. They are not all completely abstract; in Telescope we can see an object busy on a table that looks like it's about to run off the canvas with its abundance of energy. 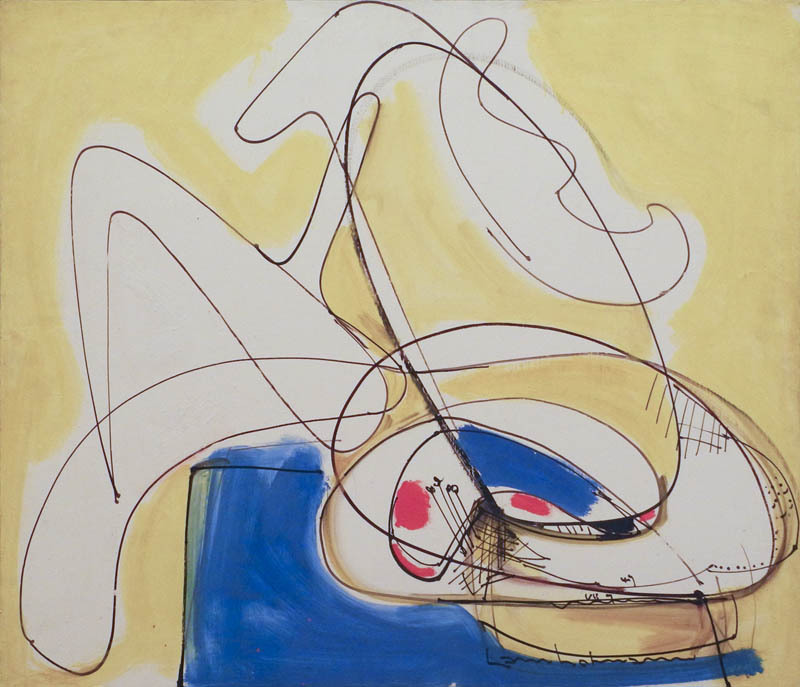 Yellow, 1945; oil on panel, 22 x 25 in. Yellow has brilliant color floating on a richly dark ground. Lines freely enclose forms or move your eye from here to there. 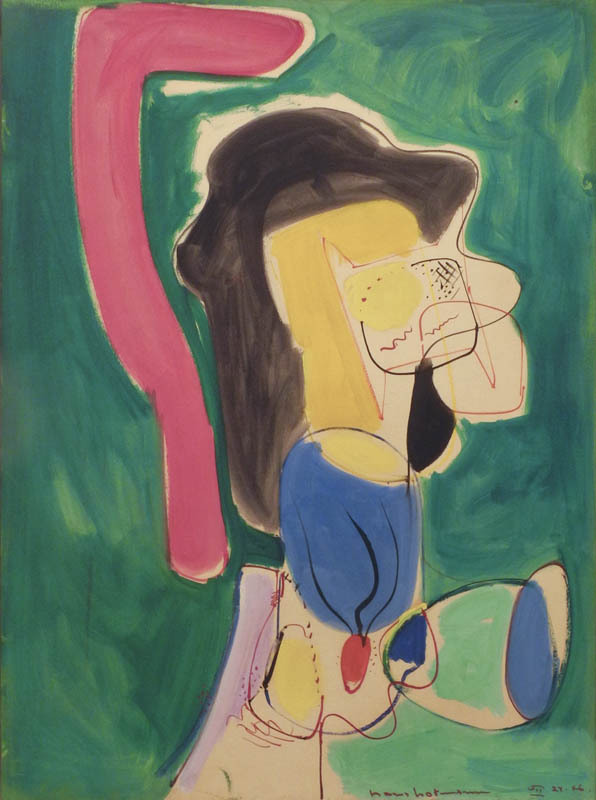 The Mannequin, 1946; oil on paperboard, 40 1/2 x 31 in. A more figural work, The Mannequin happily struts its brilliant color and wacky pink shape. Untitled, 1946; oil and gouache on paper, 19 x 25 in. These works on paper––I suppose they should be called drawings––have a darker mood for me than the previous works. Perhaps it's the red: it's the color of life, of blood, but it's also a dark color, of blood. 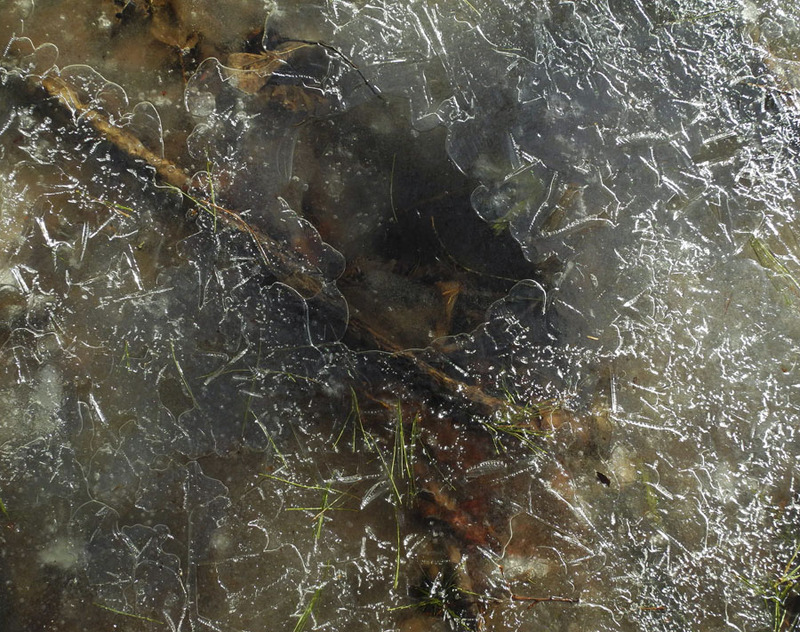 The forms are organic, squeezed uncomfortably into a tight space, writhing, pressing outward. I should mention that at this time biomorphic form was widely used in the Abstract Expressionist community; Pollock, Motherwell, Gorky, Rothko all explored these forms. 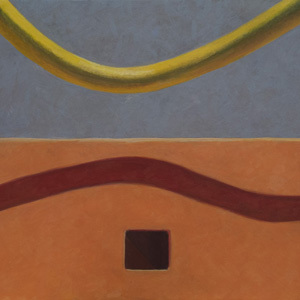 Landscape, 1935; casein on panel, 24.7 x 29.6 in. As I thought about the paintings in the show, I was curious as to what other aspects of Hofmann's work I was unaware of. In the video link above, Mercedes Matter spoke of Hofmann as being depressed because he hadn't been painting. She encouraged him to start painting again, and the landscape above is one that he produced around that time. 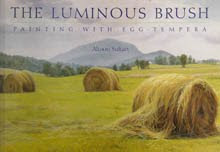 It is juicy and improvisational, a direct response to air and light and color. 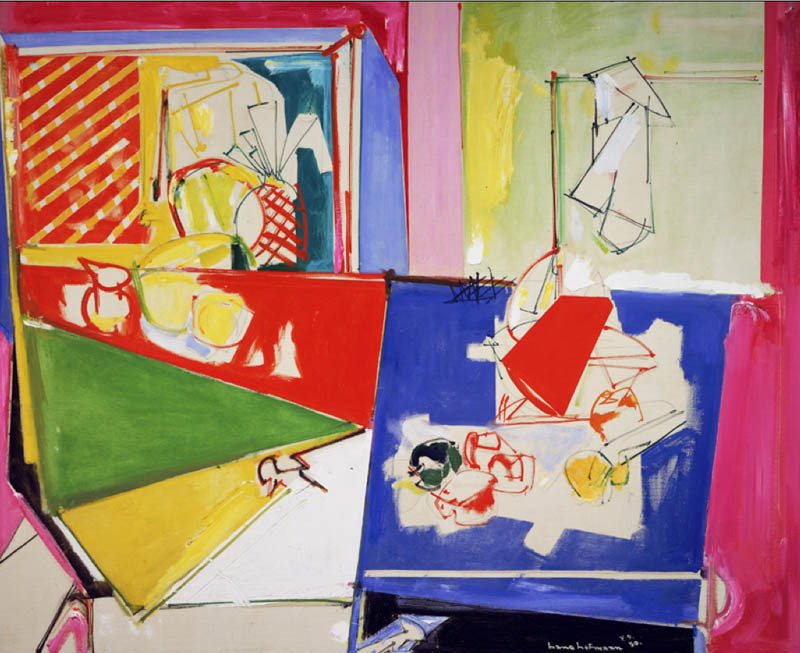 Magenta and Blue, 1950; oil on canvas, 48 x 58 in. Magenta and Blue shows another way of approaching a painting, very Matisse-like with broad areas of color and simplified details. 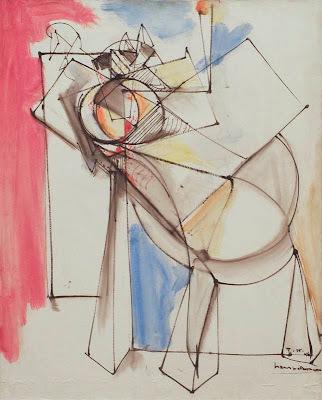 I could not find any other paintings like this by Hofmann so I don't know if he did a series like this or if it was a lone experiment. 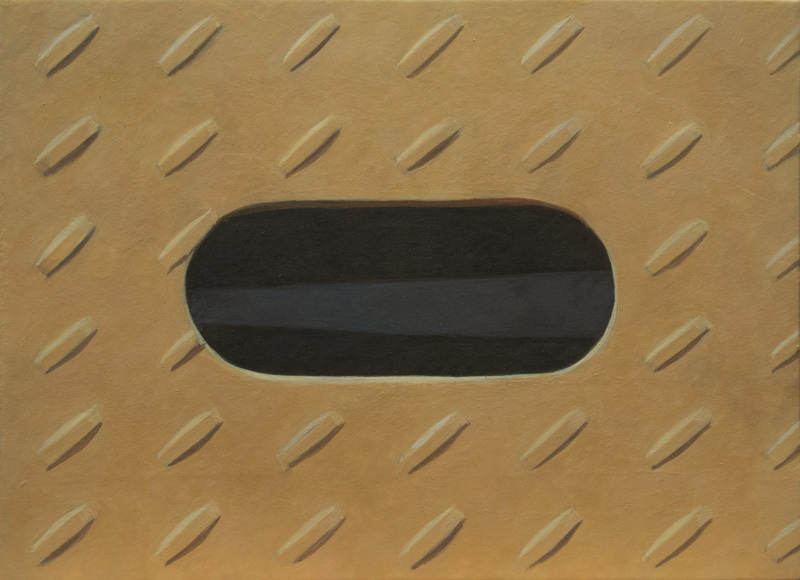 The Golden Wall, 1961; oil on canvas, 60 x 72 1/4 in. 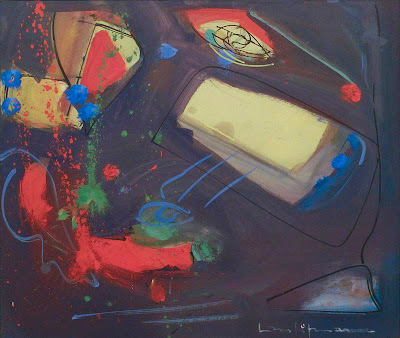 Lastly, here is a painting whose style I had thought made up the totality of his work. 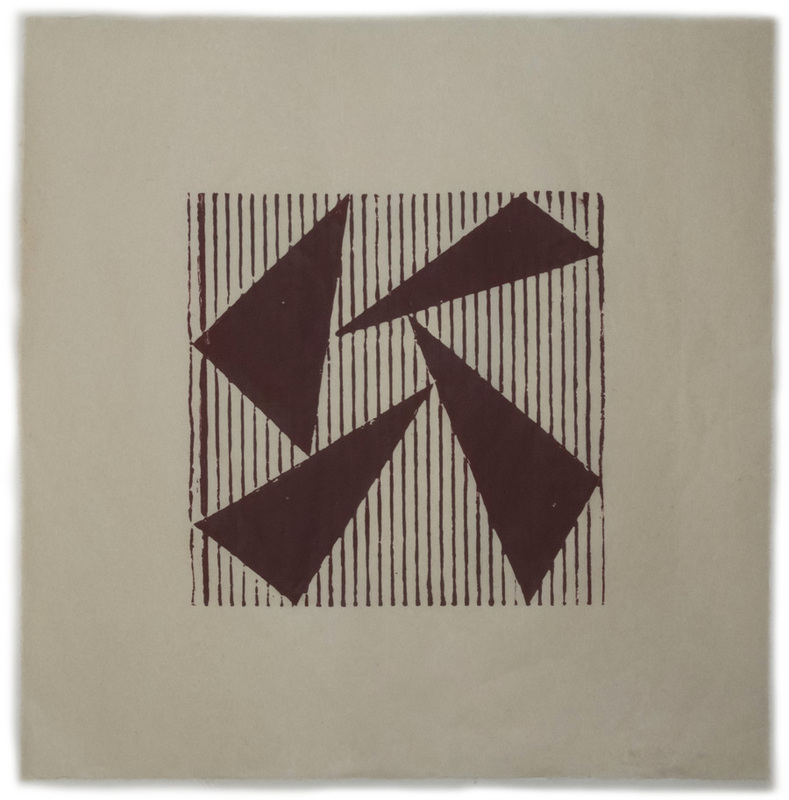 In the 60s he worked with pure abstraction with no visual references. He wrote "the ability to simplify means to eliminate the unnecessary so that the necessary may speak". 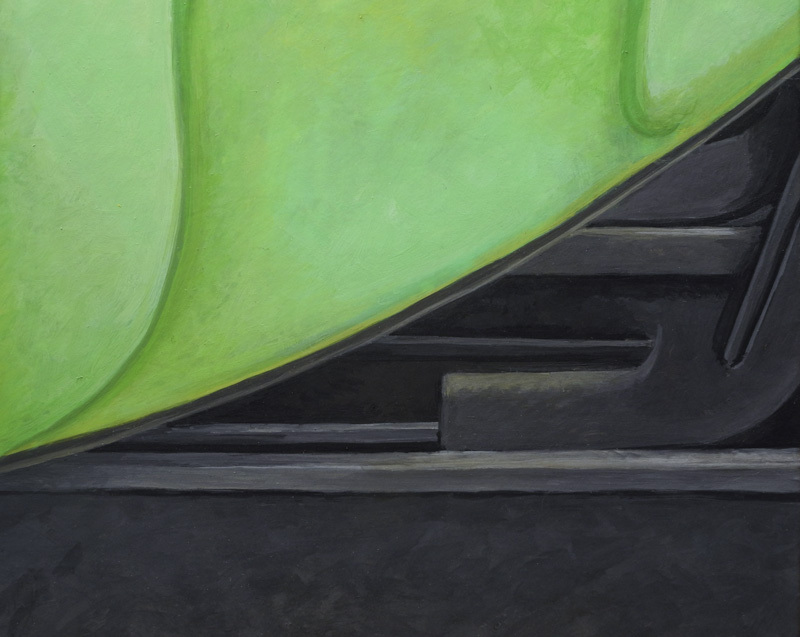 A famous idea of his is that color and form in their "push and pull" create depth and movement in a painting; representational perspective is not needed. PBS created the "Push and Pull Puzzle"so you can see how colors pop or recede. 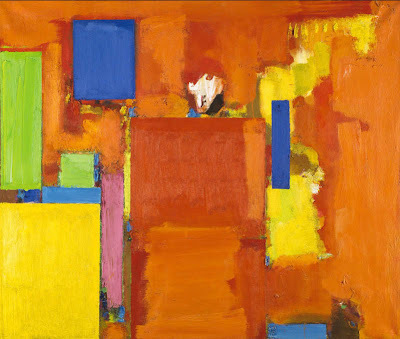 Of course this is basic color theory, but Hofmann built his late work around it. I'd always found these paintings a bit clunky and graceless, but now feel I have to look again.